Spring has finally arrived in Lanesboro, Minnesota! We are excited to put away our winter boots and mittens and soon we will be wearing sandals and garden gloves. After the long winter we look forward to operating our Bluffscape Amish Tours again this year. It’s always exciting to see the Amish folks preparing their greenhouses and gardens. 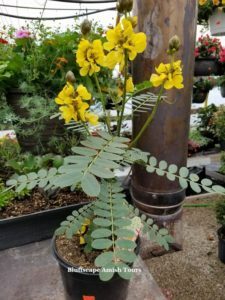 Cassia Plant – Smells like popcorn! Lenora Flowers is a greenhouse at one of our Amish tour stops. The greenhouse opened for the season on Saturday. What a treat to see the flowering plants and green foliage. It is a great contrast to the brown countryside sans the white snow. When you step inside the greenhouse the smell of fresh flowers and plants fill your nostrils with a scent of summer to come. They even have a plant, Cassia didymobotrya, which smells like popcorn! When the leaves are rubbed a buttery popcorn scent reminds one of going to the movie theater. Hundreds of hanging baskets with multiple, colorful flowers fill the greenhouse along with other beautiful annuals and perennials. You will also find a few vegetable plants to add to your garden. Lenora Flowers will have beautiful Mums to sell in the Fall, but I can wait a while before seeing Fall once again. 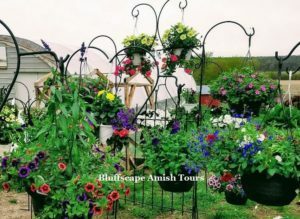 Get out and revel in the beautiful, Spring weather and join us on a Bluffscape Amish Tour in historic Lanesboro. You will enjoy the fully narrated, three -hour tour about our Amish neighbors by our pleasant, knowledgeable guides. The greenhouse is available to browse as well as Fannie’s quilt shop, the Amish bakery, Amish hand-crafted basket shops, and Amish-made wood furniture stores. Soon you will see fieldwork done with horse-drawn equipment, no tractors used in Amish fields. You will also find pickles, jams, jellies, candles, leather goods and remember to pick up a bag or two of the delicious, buttery cashew crunch! Bluffscape Amish Tours depart from the Stone Mill Hotel and Suites in Lanesboro at 10 a.m. and 1:30 p.m. Monday – Saturday. Please call 507-467-3070 to reserve your seat on the tour.